Fr. John has received popular acclaim for his ability to inspire others to live a more Christ-centered life through his profound, humorous messages and engaging gift of speech. His books are compilation of his most memorable homilies. 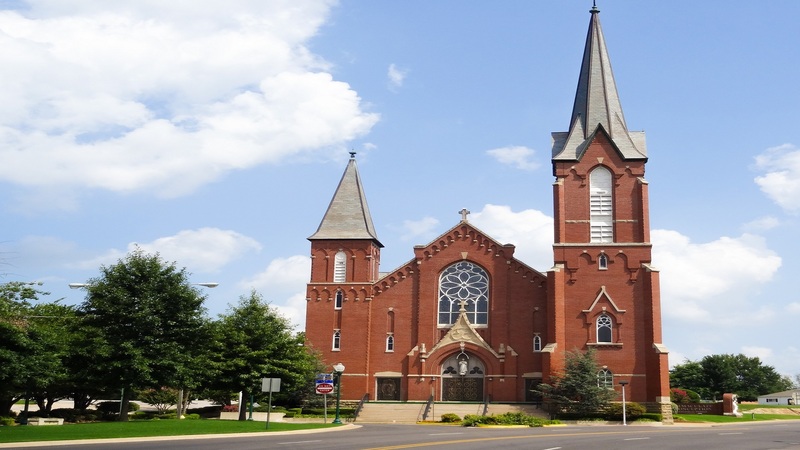 Many generations of children have passed through the classrooms and halls of Immaculate Conception School and Trinity Junior High in Fort Smith, St. Joseph School in Fayetteville, St. Theresa School in Little Rock since they first opened their doors. In our schools, children have received the best Catholic education with a strong academic curriculum and enrichment programs and, above all, a healthy environment in which they can learn about and serve God. We are convinced that by providing excellent education in the Catholic tradition, we will help our children obtain the necessary tools to reach their full potential as the individuals God calls them to be. To ensure that our schools will continue to provide quality Catholic education to the children of our communities, a few years ago, the schools established a permanent safety net called Endowment Funds. The money donated to these funds is invested and the interest earned is used to fund the operating budgets of both schools. With the well-being of these four Catholic Schools, Fr. 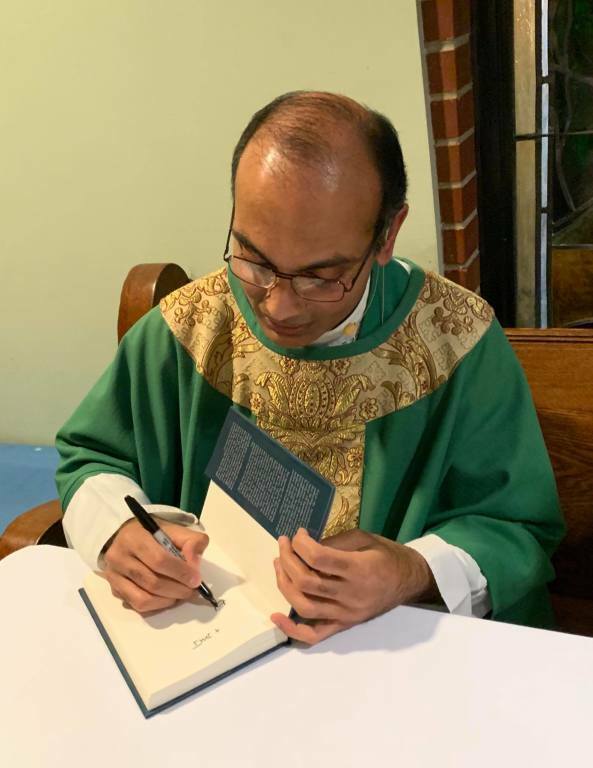 John, Pastor of Immaculate Conception, former pastor of St. Joseph, and St. Theresa’s Alumni requested that proceeds from the sale of his first book “Oh, For The Love of God” be destined to Immaculate Conception and St. Joseph Schools’ Endowment Funds as part of the “Tomorrow’s Promise Campaign” effort. Proceeds from Fr. 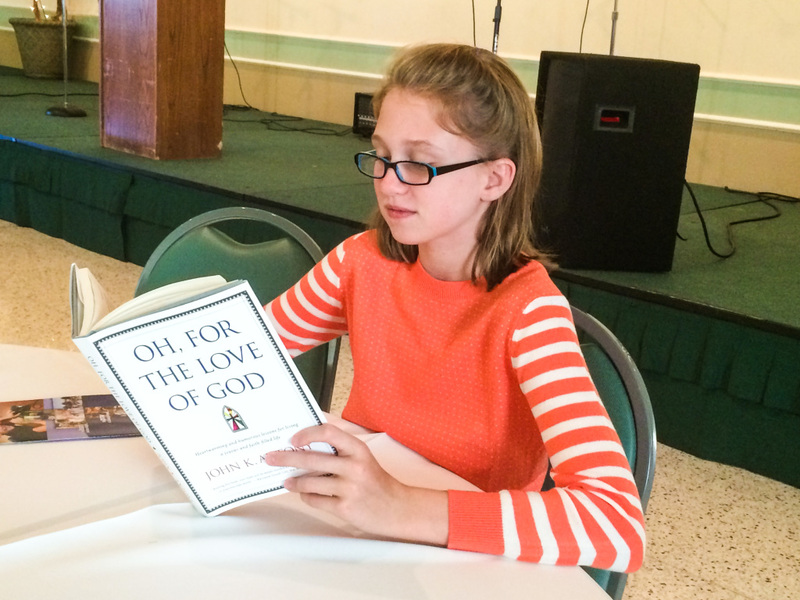 John’s second book "Oh, for Heaven's Sake," along with the abridged audio series, are destined to St. Theresa School as part of the “Roses from Heaven Campaign” effort. Funds raised from Fr. 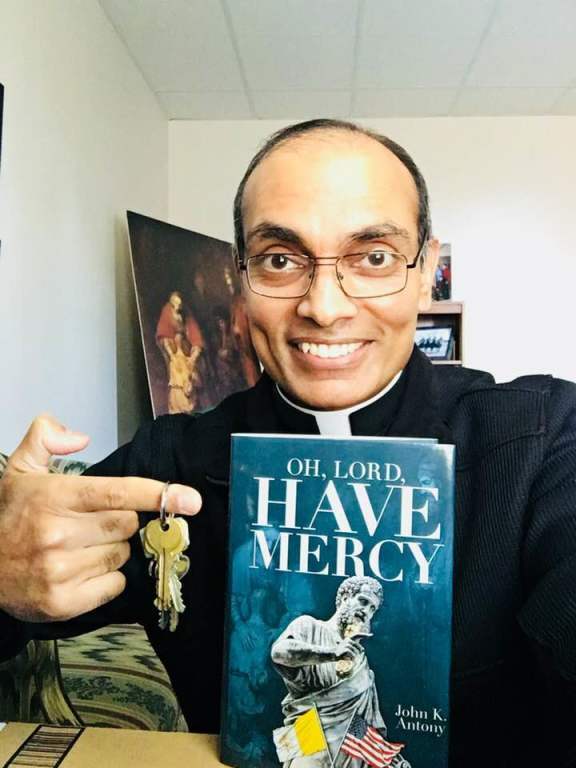 John's third book "Oh, Lord, Have Mercy" are destined to Trinity Junior High Strike a Match Campaign. Oh, For the Love of God is a collection of his most popular sermons, organized around five themes that will help believers encounter Christ with ease: “Discipleship,” “Fellowship,”“Grace,” “Self-awareness” and “Discernment.” Oh, For the Love of God will help Christians of all faiths keep their eyes on the sweet prize of salvation, while teaching how to deepen and strengthen our relationship with the One who created us and yearns to be with us. 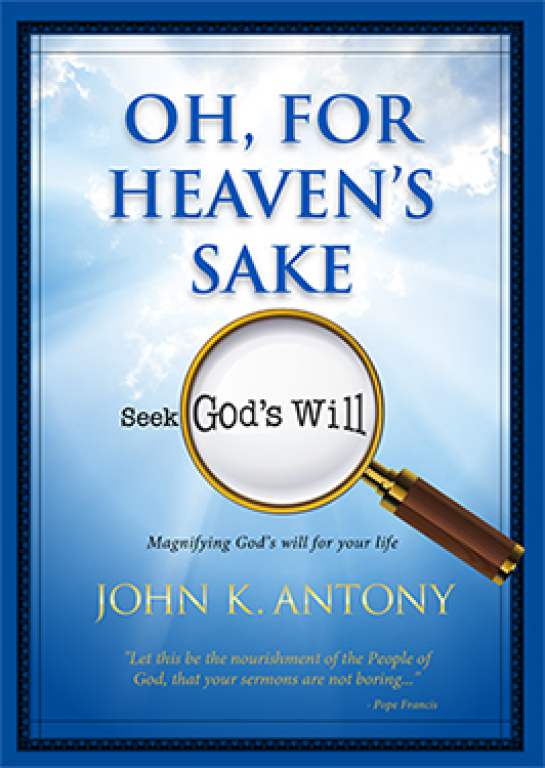 Oh, for Heaven’s Sake is a collection of his most popular homilies, organized into four areas of spirituality to help others seek God’s will: Christian Living, Marriage & Family, Spiritual Warfare and Liturgical Seasons. The purpose of this book is to magnify God’s will for your life so that your future, too, may be filled with hope. The old Baltimore Catechism gave a clean answer to the complex questions of doing God’s will when it stated, “God made me to know him, to love Him, and to serve Him in this world, and to be happy with Him for ever in heaven.” (lesson 1,no. 6). That’s what God’s will looks like from thirty thousand feet. But what does it look like in the troubled trenches of daily living?..... The one prayer common to all Christians is the “Lord’s Prayer.” Jesus Himself taught it to us, His disciples. One of the principal petitions of the prayer is, “Thy will be done on earth as is it heaven.” God’s will is already done perfectly in heaven, where not one angel or saint deviates from divine direction. Heaven is where utterly free wills love, learn, and laugh in eternal harmony. As a result, the heavenly hosts are perfectly and perpetually happy. Our happiness, too, depends on doing God’s will “on earth as it is in heaven,” assuring us a future of hope. The book is structured in order to facilitate a conversation between Pope Francis and modern American readers. Pope Francis offers twenty-first century American Catholics a profound personal encounter with the Merciful One. Each chapter in the book draws attention to one of the pope’s four major documents: Lumen Fidei (the Light of Faith), Evangelii Gaudium (The Joy of the Gospel), Laudato Si’ (Praised be to You), and Amoris Laetitia (the Joy of Love). The book offers a variety of homilies reflecting on scripture passages followed by a quotation from the papal document related to each homily to create an effect of listening to the same point in two languages: American speak and pope speak to create a bridge of understanding and help readers to get to know Christ himself. If you are interested in acquiring any of the books or the audio series, please contact Cindy McNally at the Church Office 479-783-7963 or download an order form here.